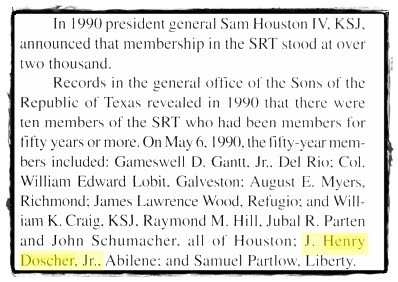 Bedford Shelmire Wynne received early lessons in elitism while attending the Texas Country Day School of Dallas (since merged into St. Mark's) as a child. Judging from its illustrious alumni, it was no ordinary school. His name was mentioned in the Galveston newspaper in 1938 as a member of a basketball team that lost to Tabor Academy of Massachusetts, playing in Galveston at the time. 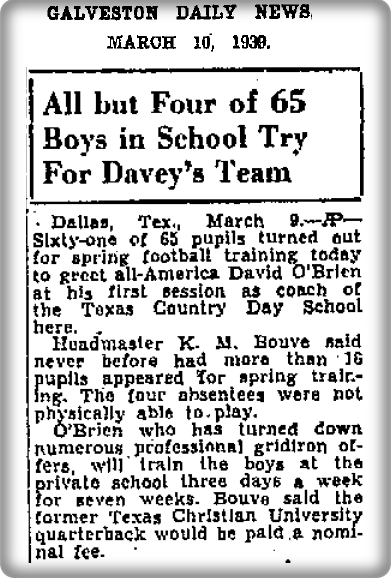 The school's headmaster, Kenneth Bouve, had come to Dallas from Tabor and often arranged the games with former associates of his old school. 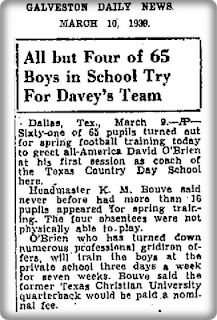 Davey O'Brien was the football coach during the time Bedford Wynne was a student at the Texas Country Day School. After two seasons with the Eagles, O'Brien retired from football to become an agent in the Federal Bureau of Investigation (FBI), where he worked for ten years. After completing his training, he was assigned to the bureau’s field office in Springfield, Missouri. He was a firearms instructor at Quantico, Virginia, and spent the last five years of his FBI career in Dallas. He resigned from the bureau in 1950 and went to work for H. L. Hunt in land development. He later entered the oil business working for Dresser Atlas Industries of Dallas. O'Brien also served as president of the TCU Alumni Association, a YMCA board member, a chair of the Tarrant County Democratic Party, a supporter of Golden Gloves youth boxing programs, and a deacon of University Christian Church. He was elected to the College Football Hall of Fame in 1955 and the Texas Sports Hall of Fame in 1956. From 1960–1964 he served as a color commentator for Dallas Cowboys television broadcasts. In 1971, O'Brien was diagnosed with cancer and underwent surgery to remove a kidney and part of his right lung. He died from cancer on November 18, 1977. O'Brien's 1938 Heisman Trophy combined with Tim Brown's 1987 Heisman Trophy gave Woodrow Wilson High School in Dallas the distinction of being the first high school to produce two Heisman Trophy winners. In 1989, O'Brien and Brown were inducted together into Woodrow Wilson High School's Hall of Fame when it was created in celebration of the school's 60th Anniversary. Most of these high-school age boys would end up in the war as they approached manhood in the early 1940's. Much would be expected of them as the world began to change before their very eyes. Some of his classmates would even help change that world. Bedford certainly contributed to those changes in his own inimitable way. The Texas Country Day School was originally located on Preston Road at its intersection with Walnut Hill Lane. Now the school is situated in an area between Royal Lane to the north, Walnut Hill Lane to the south, and between Preston Road on the west and Hillcrest Road on the east, St. Marks School in Dallas is surrounded by some of the wealthiest families in Texas. Its history in brief: "St. Mark's was founded as a merger of the nonsectarian Texas Country Day School and the Episcopally-associated The Cathedral School. To solve the religious question, St. Mark's was founded as a nonsectarian school with the agreement that Chapel services would be Episcopalian, led by an ordained Episcopal minister. The school officially opened as St. Mark's School of Texas in 1953." For years, St. Mark’s has been the place to send your son if you’re looking for an all-male, private school. And it’s no wonder, with a dynamite board of trustees, and a cluster of well-appointed buildings, including, would you believe, a planetarium. St. Mark’s has the pedigree, dating back to 1933 when some of Dallas’ finest founded The Texas Country Day School, an ancestor of St. Mark’s. Nowadays, an all-male student body isn’t particularly important to the school, because St. Mark’s graduates tend to flock to UT-Austin. Way back when, the prep school atmosphere was thought to be instrumental in preparing Dallas boys for places like Harvard and Yale. During the 1960’s, St. Mark’s built a reputation on math and science, but now is trying to stress the arts too. The math emphasis still lingers and seniors score high on the college entrance exam math tests, but closer to average on verbal sections. Last spring produced a bumper crop of National Merit semi-finalists, 10, while usually the number is somewhat lower. St. Mark’s each year accepts 25 first graders, 17 second graders and later adds 25 boys at the fifth grade and 50 more at the seventh. Thereafter only about one or two are admitted to each class every year. St. Mark’s wants to see the boy grow into the man. Teachers have plenty of time to coach them at one thing or another -- football, photography, etc. Physical activity is important and sports abound. If you can’t handle football or basketball, there’s always inter scholastic water polo. THERE ARE some prep schools where the headmaster embodies the institution’s traditions and goals. St. Mark’s is not one of them. St. Mark’s has its roots in its board of directors, which in turn is rooted in the city’s most-established establishment - oil, high technology and, in the old days, cotton. 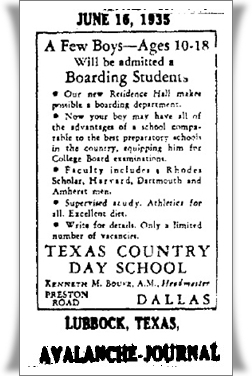 St. Mark’s predecessor, the Texas Country Day School, opened in the fall of 1933. Chief among its founders was Wirt Davis, an oilman with a young son who he thought should get a first-rate education without having to take a five-day train ride to the East. Davis got his friend Eugene McDermott of Geophysical Services Co. (now Texas Instruments) interested in the school as early as 1937. McDermott and his wife, Margaret, then got their friends Cecil and Ida Green interested in the school. Though they were childless themselves, Ralph Rogers, a former board president, recalls, the Greens "always felt that the country’s future depended on leadership... and that leadership depended on education." When it opened with ten students and four faculty members in September 1933, Texas Country Day School was located two miles north of the Dallas city limits. With the post-World War II economic boom, this area became an affluent suburban neighborhood, and many of its youth attended Texas Country Day School. Texas Country Day School for Boys, Dallas. capital stock $10,000; education. Incorporators: Mrs. R.R. Penn, Wirt Davis, Arthur L. Kramer. On April 6, 1938 Bedford Wynne's name appeared in newspapers as a representative of a Texas Country Day School of Dallas basketball team. Players of the Dallas team were Gilbert and John Allen, Robert Giles Jr., Edwin Hopkins Jr., Latham Jones, Brown McGaughey, Robert Mead, Philip [O.] Montgomery Jr., John Shelton, Bedford Wynne, and Robert Raney. L.W. Hall was coach of the team. John Blade Jr., William Bullington, Cedric Burgher Jr., Everett DeGolyer Jr., Charles Dexter Jr., Henry Doscher, William Hoyes, Jon Hulsey, and Eugene Mead accompanied the team to Galveston, where they played Tabor Academy basketball team of Marion, Mass. Dallas lost the game. Dr. Robert Byron Giles Jr. maintained his passion for research throughout his 40 years as a Dallas internist. His research background included working on the Manhattan Project during World War II and being one of the first Western doctors to explore the mysteries of the hantavirus as an Army medical officer during the Korean War. Dr. Giles, 87, died Dec. 16 of natural causes at the C.C. Young retirement community in Dallas. Services were Saturday in Dallas. "He liked the challenging cases, where he really had to use his mind," said his daughter, Caroline Banks of Minneapolis. "The researcher in him was so strong. He liked the challenge and the pleasure of diagnosing something accurately in time to be of help." Dr. Giles also liked people and often told his family about interesting patients, his daughter said. Dr. Giles had a subspecialty in rheumatoid arthritis and saw patients from Central and South America. Some of those patients were accompanied by their extended families. "The whole office would shut down, because he had not only the spouse, but aunts and uncles and children of these people from out of the country," Dr. Banks said. Dr. Giles was born in Dallas, where he attended Texas Country Day School, now St. Mark's School of Texas. Dr. Giles became a researcher after graduating from Dartmouth College. "He was at the nuclear physics department at MIT," his daughter said. "He didn't know it at the time, but he was involved with the Manhattan Project." Not knowing he was helping the Army develop the first atomic bomb, Dr. Giles repeatedly tried to enlist to serve in World War II. He had twin uncles who were generals in the Army Air Forces, his daughter said. "He kept wanting to enlist, but he was told, 'No, your work here is too important,' " his daughter said. In 1943, Dr. Giles married Patricia Wellington. Mrs. Giles died in 1992. After the war, Dr. Giles attended medical school, graduating from a two-year program at Dartmouth and completing his medical degree at Harvard University. Dr. Giles completed his internship and began his residency and a fellowship at Massachusetts General Hospital in Boston. His studies, however, were interrupted when he was recruited as an Army medical officer for service during the Korean War. He was chief medical officer with the 8228th Mobile Army Surgical Hospital in Korea. Dr. Giles soon found himself doing research in the war zone. Some Korean soldiers and civilians brought to his hospital had a disease unknown to Western medicine, his daughter said. "He was one of the first Westerners to identify and research hemorrhagic fever," Dr. Banks said. "Because of his previous interest in research at MIT, he was very curious about the nature of this virus. He didn't want to just treat patients; he wanted to understand what it was." The hantavirus was originally known as Korean hemorrhagic fever, and gets its name from the Hantaan River in Korea. In 1953, Dr. Giles received an Army commendation for meritorious war-zone research, treatment and training in Korea. After his military service, Dr. Giles completed his residency in Boston. In the late 1950s, Dr. Giles returned to Dallas, where he was an assistant professor of medicine in charge of a research laboratory at what is now UT Southwestern Medical Center. In the early 1960s, Dr. Giles entered private practice with his father, Robert B. Giles Sr., at the Medical Arts Building in downtown Dallas. When his father retired, Dr. Giles moved his practice to Presbyterian Hospital, where he became chief of the medical staff, his daughter said. Dr. Giles was an accomplished and avid golfer. He also enjoyed sailing and watercolor painting. In addition to his daughter, Dr. Giles is survived by his wife, Ann Baker Giles of Dallas; another daughter, Phoebe Giles of Dallas; two sons, Ben Giles of Bishkek, Kyrgyzstan, and Richard Giles of Great Barrington, Mass. ; three sisters, Frederica Reily of Baton Rouge, La., Ann Kimbrough of Dallas and Marie Louise Baldwin of Dallas; five grandchildren; and three great-grandchildren. Memorials may be made to the Patricia and Robert Giles Jr. DMS 1945 Scholarship Fund at Dartmouth Medical School; in honor of Patricia Wellington Giles at Wellesley College; the Patricia Giles Endowed Memorial at Southern Methodist University; or to a charity of choice. WICHITA FALLS — R. Brown McGaughey Sr., 88, of Wichita Falls, died the night of June 14, 2009, at Hospice of Wichita Falls. Services are at 11 a.m. today at University United Methodist Church with military honors, officiated by Pastor Bryan Payne, Pastor Travis McGaughey and Reverend Dean Libby. Interment will be at 11 a.m. Thursday at East Mount Cemetery in Greenville. Hampton Vaughan Funeral Home of Wichita Falls is in charge of arrangements. Brown was born July 15, 1920, in Greenville to Winnie (Brown) and Wycliff P. McGaughey, DDS. He married Rowena McKinley on June 4, 1945, in Hamilton. He attended University of the South in Swanee, Tenn., for two years and then joined the Army Air Corps and graduated from Fort Stockton, Calif., with the class of 41-G. He served overseas in North Africa flying a C-47 with the 62nd Troop Carrier, pulling gliders and dropping paratroopers. Among his many heroic deeds was his participation in the invasion of Sicily. Brown McGaughey retired heavily decorated from the Air Force Reserves as a lieutenant colonel. Following the war he returned to college and graduated from Texas A&M; with a degree in animal husbandry. He was employed as an assistant county agent of Denton County and then became a full-time farmer in Lavon. Mr. MGaughey was employed by the General Adjustment Bureau in 1954 and retired with GAB in 1985. He moved to Wichita Falls in 1993 and became a full-time rancher. Mr. McGaughey was a member of the Shriners, and was an active member of University United Methodist Church and joined friends of his Sunday school class in worship and anticipated his weekly Thursday morning Men's Bible Study. Mr. McGaughey was preceded in death by his brother, Wycliff McGaughey. He is survived by his wife of 64 years; three children, Shannon Baade and husband Duane of Lewisville, Elizabeth Payne of Montgomery, Texas, and Robert McGaughey Jr. and wife Sheila of Wichita Falls; six grandchildren, April Lyle, Wendy Tinney, Bryan Payne, Travis McGaughey, Jayson McGaughey, Doug Wimberley; and six great-grandchildren with two more on the way. Honorary pallbearers are grandsons Travis McGaughey, Jayson McGaughey, Bryan Payne, and great-grandsons Matthew Lyle, Scott Lyle, and Todd Lyle. The family requests memorial contributions be made to University United Methodist Church or Hospice of Wichita Falls. Jurgen Henry Doscher, Jr . , was commissioned an ensign in the navy in 1942 and assigned as executive officer aboard the USS SC-761 in January 1943. Soon after arriving in the Solomon Islands, he became the commanding officer of the subchaser and led it through the tough campaigns in the southwest Pacific. Following the war he became a successful lawyer and retired in 1985.